In this video, I’m going to tell you about my “Six Month Mentor Program”, the things that I teach there, how I teach them and how you can benefit as an investor by joining it. 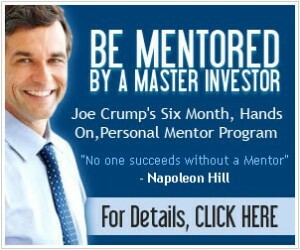 Joe: The buying event and the mentor program are all part of the same package now. A few years ago, I had the “Six Month Mentor Program” and I had a separate boot camp which I would bring people to. Both of them cost $10,000 a piece to come to, but what I discovered was that the people who were in my “Six Month Mentor Program” needed to get together with me, I needed to meet them and I needed to work with them directly, and the people who came to my boot camp would go home and then wouldn’t do the work; they needed that support over the next six months. So, instead of charging for both of these events independently, I piled them all together in one big package. It’s still the same price but now you get both things together. Joe: The buying event has been a phenomenal experience. One of the struggles that I had as a teacher was trying to get my students to follow through with what I teach them and to make sure that they do the things that I teach them. We know that it works. Joe: We start them out with the “For Rent Method” and get them on the phone and making calls and making offers. Ultimately, they don’t have to make these calls. 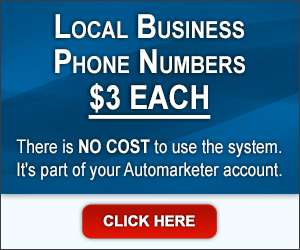 Once they learn how to do it, we get the automation going and get the calls to come into them. Joe: But at the beginning, I think it’s very important that they make the calls and learn how to do this process. You only learn by doing it. It’s like playing the piano – you can learn sheet music and study music theory all your life but if you don’t sit down and touch those keys and practice the scales, you’re not going to learn how to do it. Joe: What I do at this event is actually get you doing the work. That’s where I felt the biggest stumbling block for people getting started was: they needed somebody to kind of take them by the hand and show them, ‘Do this first. Focus on this one thing.’ That’s what I do at the buying event. Joe: I teach for the first two and a half to three hours on the morning of the first day. I teach the for rent process. Then we break for lunch, and after lunch, we come back and we start making calls. We actually make offers on real property, not just in Indianapolis, but in wherever the particular student is located, i.e. if they’re located in Canada, it’s in Canada, if they’re in California, it’s in California, etc. – Everyone makes them to their own area and location. Joe: I show them how to do that, who to call and what to say to them. I give them a script. We go through the whole process of role playing so that they are comfortable saying the words. It’s a very exciting time. Joe: Just to give you an example of what kind of success we’re having as well with this – we put 48 people into a room (these are all mentor students of mine) and by late afternoon after they had made the calls, we had 98 yes’s and 98 deals put together with the For Rent Method, so these people went home then and put together a bunch of these properties. So it was a very exciting time. Joe: I think that it proved to me that if I just get people working and get behind them and sort of breathe down their neck and say, ‘You need to do this. Make the call. Here’s what’s going to happen.’ Then, when they did it, they got confidence and I could see a huge difference between what they were saying to me in the morning and what they were saying to me after they had gotten a yes. It’s hard to describe what I saw on their faces, and I think it was hard for them even to describe the feeling that they had other than excited, elated and overjoyed that they could actually get a yes on a zero down offer, not using any credit or any of their own money, doing it from a remote location over the phone and not even having to meet with the people, using the leads that are common and free anyplace in the country. Joe: That was exciting to them, and suddenly I think it gave them a vision of what’s possible in this business and how you can take this business and actually quit your job, and, you can work full time at this or you can do it part time. Joe: Most of the people working part time are able to reproduce their current income as it is right now. We have people that have replaced high six figure incomes at this business, and that’s just with the cash flow and the For Rent Method. Joe: I’ve been doing this series of videos to give you an idea of some of the things that I’m teaching. And as you know, there are tons of different things that we do, but you have to start somewhere, and no business is sustainable without cash flow. So, you have to get the cash flow going first, and that’s what the buying event is all about. Joe: Just to kind of give you an idea of how this buying event works: It’s in Indianapolis; I always do it there. I used to travel around and do it in different places, but there’s no reason to go to Vegas or California other than the fact that it’s Vegas or California. Joe: The reason we’re here is to get to work and to learn the things that we need to learn. We come and we focus on this. That’s all we do. We start in the morning and we go to night. I usually meet with them on Friday night just in the lounge just to kind of meet them and get to know who they are and talk to them a little bit. Joe: Some of the people are old friends who have been here before, or they’ve been in my mentor program but I’ve never met them personally and they finally come and we go to the events together. Then on Saturday, we start in the morning, we go all day long into the evening, then after the evening, we all go together (this is a small group by the way) as a group to a local restaurant, sit down together and have a drink and talk about what they learned through the day. I’m right there with them through the process. Joe: My goal is to develop a relationship with everybody that comes through my program so that they know that I’m behind them, I’m supporting them and I’m in their corner making this happen. Joe: The other goal that I have for them, other than getting them going, is that they meet the other people in my group because there are a lot of good people with positive attitudes. One of my rules about getting into my program is that you have to have a positive attitude. I don’t allow whiners and complainers in this group, so if that’s who you are, you can’t be involved (because it just shuts everybody down). We want to keep things positive. Joe: And, I want to create a mastermind group. Most of the techniques that are coming out of this program and what I’m teaching are things that I’ve learned from my students. I think I’ve learned more from teaching than I ever learned in my first ten years in my business before I started teaching – and it’s been phenomenal. 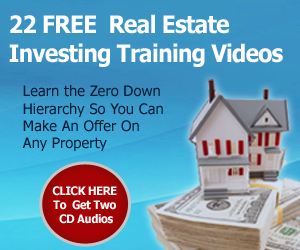 Plus, I’ve been able to take the internet marketing that I’m doing here in selling information products and apply that to real estate investing. That’s been even more exciting. Joe: Then, people will go out and tweak it and they’ll do it in different parts of the country and different markets, e.g. up markets, down markets, high end markets, low end markets and all sorts of different markets that we’ve been using this in over the past few years. We change our techniques a little bit over time but most of them are evergreen – they’re working all the time for us. Joe: With the market the way it is right now, we’re in an extraordinary time to be able to make a lot of money in real estate, and that’s very exciting. 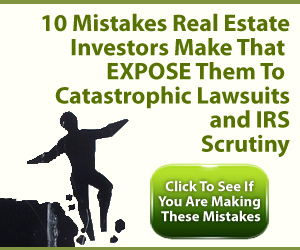 You need to be able to taking advantage of it right now if you’re at all interested in becoming a real estate investor. Joe: By the way, if you are a realtor, you ought to be looking into this as well because you’re probably hurting as well because your buyers can’t go out there and get loans very easily. We have ways to help realtors get more listings, get more buyers and do a lot more business just with their real estate agency business, and when they take those things to the next level and go into real estate investing, they make even more money, so there are a lot of exciting things going on with that as well. Joe: If you’d like to find out more about my program, I’m putting the URL below the web address that you can go to on the screen. You can take a look and see some of the things we’re doing here, what the cost is, the different kind of payment plans we’ve got, etc. Joe: It’s a $10,000 program but there are discounts in the process. If you’re a member of my “Cash Flow Program”, which is a $39 a month newsletter and audio or video that I send out every month, it’s automatically 30% off. If you’re not in that, you can get into it; it’s cheap. Joe: So, that’s $3,000 right off the bat. So, its $7,000, and, you can pay $2,000 up front and pay it off over 12 months for $416.67 a month, or, if you pay it all in a lump sum, I’ll take another $1,300 off and it’ll only be $5,700. So it’s really not as expensive as it sounds. You can get in very cheaply. Joe: I’ll finance most of it for you. You don’t have to have good credit. You don’t have to have a job as far as I’m concerned; I’ll finance it. You come up with the $2,000, I’ll finance the rest of it for you and I’ll help you make that money so that you can make those payments. Joe: There’s a couple of caveats here I want you to be sure you understand. Give yourself time to learn this process; it doesn’t happen overnight. I tell everybody, ‘Give yourself three to four months before you can expect to make any money in this program’. I’ve had people who did it in a week, but they’re the exception, not the rule, so give yourself time. 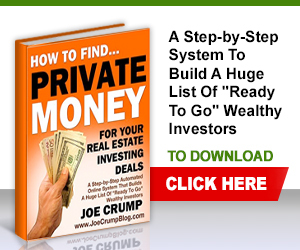 Joe: This is not a get rich quick scheme – this is a business building program and if you treat it like a business, I guarantee that you’re going to make money. 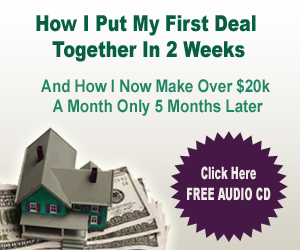 I have a guarantee on this program – I guarantee that you will buy a property within the first six months and you will sell it and make money, or I will give you back all your money for the program. Joe: Now, there is one condition to that guarantee – you have to follow through with what I teach. If you follow through with what I teach, and I make it very specific in our agreement what those things you have to do are so that there’s never any question about what those things are that you have to do, I guarantee that you will make the money. I also guarantee that you won’t make a dime if you don’t do the work (so don’t get involved in the program if you’re not going to follow through or if you’re not going to do the work). Joe: If you’re really serious, you need eight to ten hours a week to be able to make this work, so if you don’t have eight to ten hours to devote to this, don’t do it. I’m not talking about just the training part – I’m talking about actually doing the work. Joe: There isn’t much training you have to do to get started. I give you a ton of information when you sign up for the Mentor Program, and when you sign up for the Buying Event, I give you two big boxes of material with CDs, DVDs, audios and also thousands of hours of conference calls online with lots of information and different techniques that we use and have used over the years. Joe: It’s overwhelming to everybody that starts, so I started telling people, ‘Put all that stuff aside. Don’t worry about any of the automation. Don’t worry about any of the “Subject-to” stuff. Don’t worry about building long term wealth and passive income. Don’t worry about that stuff right now. What I want you to worry about is developing cash flow. I want you to get to the cash as quickly as possible because if you do that, it’ll give you incentive to go to the next level and the next level.’ You have to walk before you learn. 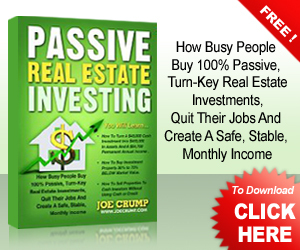 Joe: The thing about real estate investing is that it’s not like a four year college where you have to go four years and then, maybe you get a job, and MAYBE you make $50,000 a year, and then you’re working 40 or 50 hours a week and slowly and gradually over many years build your way up to making $70,000 a year, which isn’t very exciting – this is something where you can start making money almost immediately. I’ve had people who replaced their six figure income within a month of starting this program. It is possible to do it if you put the effort in. Joe: Some of these people are coming in at different levels. If you’re total newbie and you know nothing about any of this, give yourself a little more time. If you know a little bit more and you’re comfortable with speaking to people, talking to people and relating to people, maybe it’ll happen a little bit faster for you, but you have to give yourself time to do it. Joe: I’m going to have you focus on just one thing. I’m going to have you listen to a two hour audio right when you start in and you’re going to start making offers that very first week and when you come to the buying event, you’re going to make offers at the buying event. 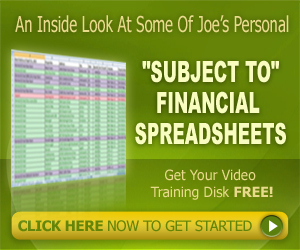 Joe: I’m also going to teach you how to automate the process. There are steps to this process. First, you have to get the cash flow. 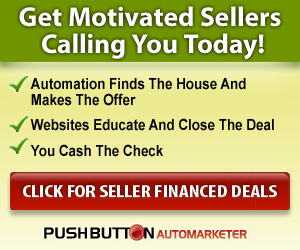 Next, you have to automate that process so that the cash flow happens easier and in less time. Next, you have to start outsourcing some of the work so that some of the other people are doing some of the things that need to be done, really low paid people who are easy to get. They’re not employees, by the way – they’re going to be independent contractors, and they’re going to do that work for you. Joe: You’re going to learn how to structure your business, whether to get an LLC or a Corporation, etc. 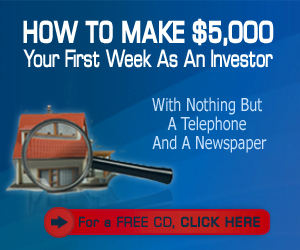 These are things that come after you start making money – making money is the first thing that you do. Joe: Then, you’re going to learn to separate yourself from your business so that you can put in just a few hours a week and have everything running for you and make the same income that you were making full time at the business. So, it’s very exciting stuff. Joe: I want to see people be able to quit their job. One of the ways that I tell people to know whether or not they can quit their job is to look at their income and ask if they’ve made consistent income that is equal to their job or needs over a three month period. Joe: I have some people that make lots and lots of money that come into this program. Their goal isn’t necessarily to replace all of their income – their goal is to replace a little bit of their income, enough so that they can survive until they can grow their business and so that they can quit a job that they hate. They may be making hundreds of thousands of dollars a year at their regular job, but they hate their job; they don’t want to go to there anymore, and this makes it possible for that to happen for them very quickly if they follow through with the process. Joe: So that’s my Buying Event. That’s my Mentor Program. There’s so much more that you can find out about. Go to the website below and it’ll tell you a little more about it. I hope that you can join us. Joe: One last thing: I don’t know of anybody that has been successful that has been successful without a mentor. It doesn’t matter whether you choose me or whether you have someone else that teaches you. If you want to be successful in this life, you need someone that helps you along, who is sort of your guiding light, who holds your hand through the process, someone who you can follow in their footsteps and go the places that they have gone before you – because they’ve already been on that path – they already know how to do it and they can be there to encourage you. Joe: And again, I’m applying for that job and I want to do that for you, but if you don’t feel that this is right for you or if you don’t feel that I’m the right guy for that, then I encourage you to find someone that you can work with who can help you get to where you want to go. Because it is one of the most important things and maybe THE most important thing you can do for yourself if you want to have your own business, the freedom and if you want to be able to give the things you want to give to your family and loved ones or if you want to be able to give back to your community and do good things for the world. Joe: It’s like Balzac said, ‘Behind every fortune is a crime’ – well, it doesn’t have to be that way. Maybe I’m rambling along here, but these things are pretty important – you don’t have to steal from people to become wealthy. Joe: Those are the things that I help you through in this program, in this Buying Event and in my Six Month Mentor Program. I hope you get involved. I look forward to working with you. Give me a call and we’ll talk about it more. Thanks.